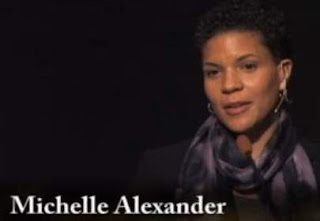 Revive Black History Month, Every Thursday with Michelle Alexander, author of "The New Jim Crow...." Exposing information how the bias application of law, re-institutes established racism in urban communities, granting life prison sentences to mainly African and Latino men. A Standford Law graduate and an experienced leader with the ACLU, Michelle Alexander is leading the charge for social justice on this issue. Education is so important, whether it's from an academic institution, self taught or hardknock U - use it to help make a change. In the video she is educating us and expressing surreal facts, regarding a social illness. It's a honor to post this blog-ver-sa-tion about Michelle Alexander, educating the public and making an attempt to correct an injustice; she is Disruptive! Have a good day and next week it may be you, Every Thursday on Create-A-Voice.